Keep up to date with our progress and milestones here. 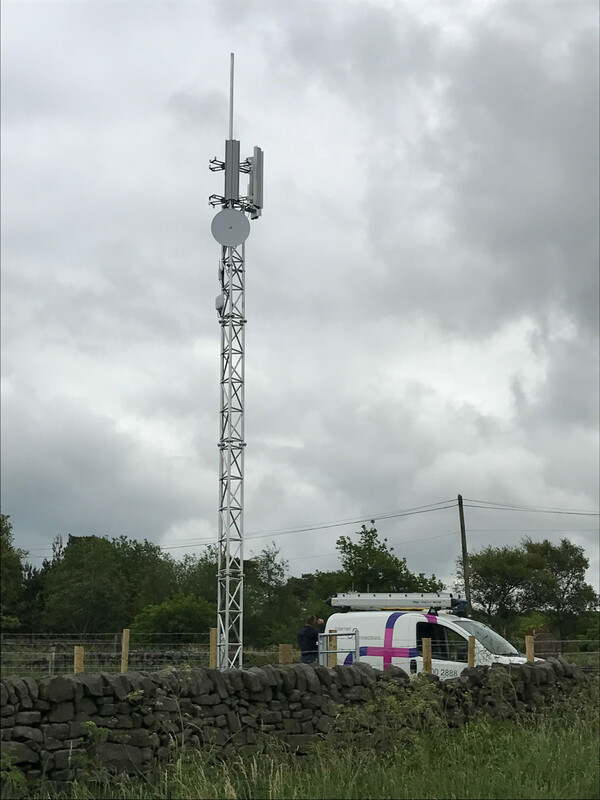 We are pleased to announce the completion of our latest superfast broadband project: Ipstones Edge. This project has seen the erection of a mast on Ipstones Edge and associated infrastructure for back haul on Basford Bridge Lane. 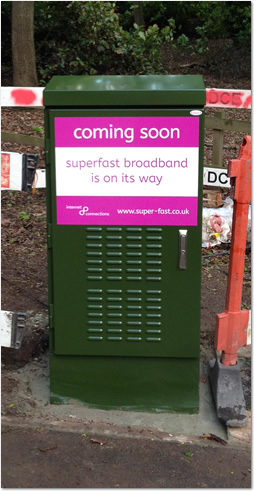 We are now able to deliver 50Mbps superfast broadband to thousands of properties across Staffordshire and beyond. Superfast II - It's On And It's Official! Back in March we announced our proposal (given enough demand) to expand our superfast network to an additional rural estate. Well, the good people of the Wainhomes estate at Leekbrook (near Leek, Staffordshire) had their say — and they said a resounding "yes!". A few months down the line, and we're in the thick of the project to bring superfast broadband speeds to the estate, and banish once and for all the frustration of sub-5Mb speeds. 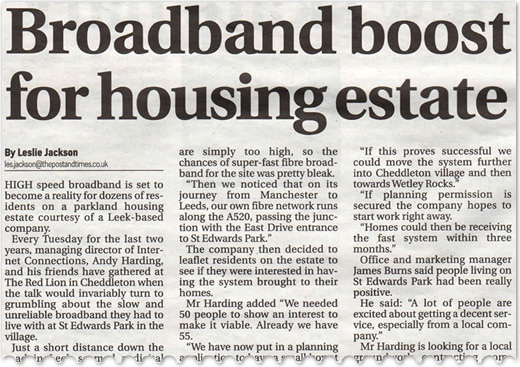 Unbelievably, it's getting on for three years since our first community broadband project finally transformed St Edwards Park in Cheddleton from a superfast "not-spot" into a superfast "hot-spot". Now, it's time to turn our attention a mile or so down the road to another broadband blackhole, the Wain Homes estate in Leekbrook. 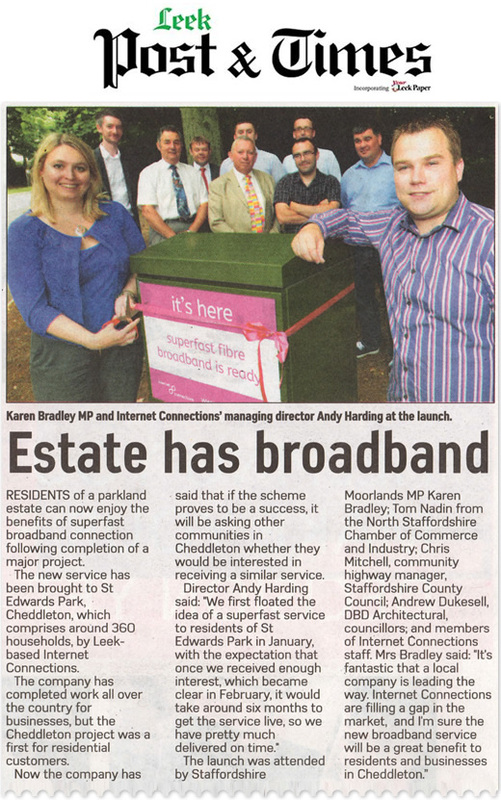 Unfortunately, the community there has (like St Edwards Park a few years back) missed out on Openreach fibre roll out. As this doesn't look like changing for the foreseeable future, we've got plans in place to extend our network to provide coverage that would see speeds of up to 50Mbps possible - a welcome upgrade from the 2-5Mbps we're hearing reports of. 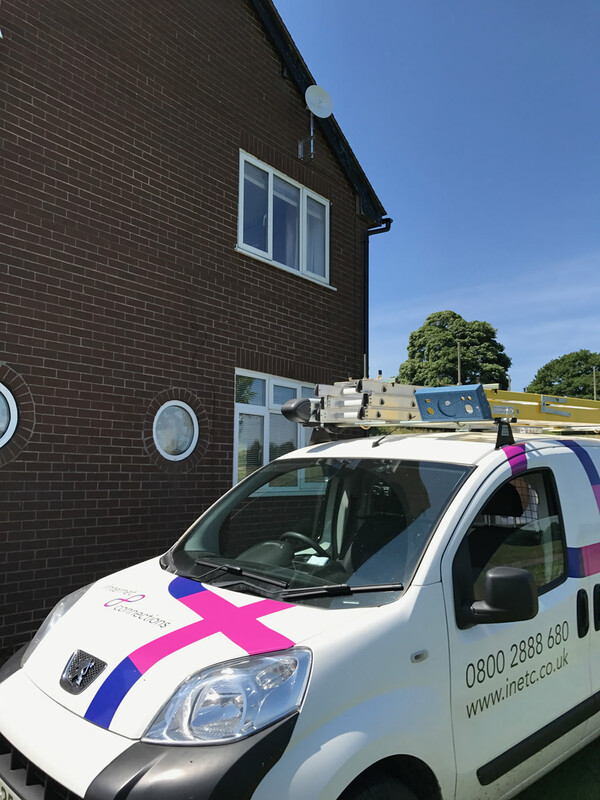 The next stage of our rural broadband project has begun — we're expanding our infrastructure on St Edwards Park in Cheddleton to enable a 1000Mbps "fibre to the home" service. Building on the foundations of our original project that introduced a superfast fibre service to the community, the expansion will also bring a range of high speed broadband services to the areas of the estate that were unable to take advantage of our superfast service. 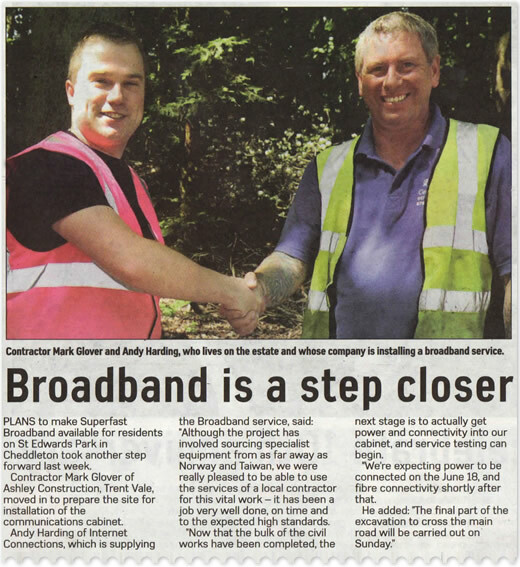 For a company that is community focussed, we're really excited that the investments we're making to our high speed fibre optic network here in Cheddleton will bring great benefits to the people of St Edwards Park who will soon be able to receive the kind of speeds that could only previously be dreamed of. We'll be providing further updates as developments continue — in the meantime, take a look at our coverage in the local press for the full story! 1. Did you know, that superfast is good for the value of your home? That's the finding of a recent report in the Guardian, which suggests that a decent fibre broadband connection can protect the value of your home by up to 20%. Great news for those that have access to superfast Internet, but a bit of a blow to those areas of the country that have been excluded from the roll out of high speed fibre services. 2. 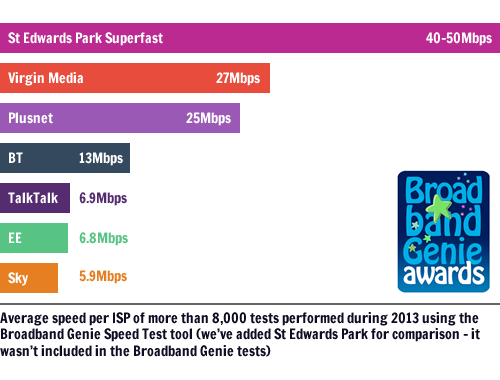 St Edwards Park: you're (sort of) top of the broadband speed league! Broadband Genie have published the results of their latest annual Home Broadband Survey, and they make really encouraging reading for us — and we hope, for you too. Now, strictly speaking, we can't officially include ourselves in the results, as we weren't part of the survey (it's one for the big boys!). However, you can see how we compare in terms of the kinds of speeds we're seeing on St Edwards Park, and it seems fair to say that we're punching above our weight! As you can see from the graph above (data reproduced with kind permission from the team at Broadband Genie) our average speeds of between 40 and 50Mbps comfortably outstrip those of the biggest providers in the UK. Not too shabby for a rural community that started out with top speeds of 5Mbps! We're starting our consultation with residents on Villa Road and Wall Lane Terrace to see if they're interested in having access to a superfast broadband service. More news on that as the story develops! We're excited to be part of Leek's first Blues and Americana Festival, which will be taking over the town from Wednesday 2nd October through to Sunday 6th October. The not-for-profit festival has been entirely organised by volunteers, and enjoys the support of many local businesses - as main sponsor this year, we're really looking forward to seeing the town and its many venues transformed at the start of October. To find out more, follow developments on Twitter and on the festival website and Facebook page. With the Superfast service now up and running on St Edwards Park, we recently had our official launch to celebrate the culmination of six month's planning, building, digging and connecting to bring fibre optic broadband to Cheddleton. Our visitors at the launch were local MP Karen Bradley (who very kindly carried out ribbon-cutting duties!) along with Parish Cllr. Michael Bowen, Tom Nadin of the North Staffordshire Chamber of Commerce and Industry, Chris Mitchell of Staffordshire County Council, and Andrew Dukesell of DBD Architectural. "It's fantastic that a local company is leading the way. 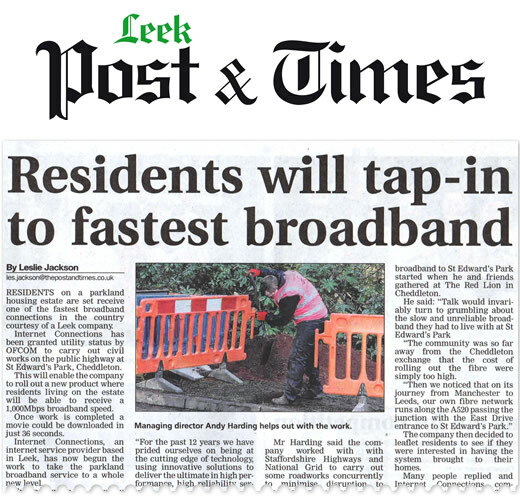 Internet Connections are are filling a gap in the market and I'm sure the new broadband service will be a great benefit to residents and businesses in Cheddleton. Modern infrastructure for communications is vital to the economy of our area and I'm pleased to see an option is available in Cheddleton. Well done to Andy Harding and his team at Internet Connections. "Small business are the life-blood of the Moorlands economy - and this is a great example of innovation that small companies tend to show. I have been campaigning for better broadband access in towns and villages in our area so this is a fantastic addition. I hope it's the sort of thing that will not only offer improved service for entertainment but also encourage people to set up businesses". "The work that we've put into building the infrastructure for Superfast on St Edwards Park has benefits for businesses in the area too. Now that we've expanded our fibre optic network, we can start to offer high speed, commercial connectivity to businesses in the region at more competitive prices than was possible before. "Poor broadband speeds and infrastructure, in rural areas, are a real problem for both residents and businesses. They can affect a firms capability to communicate with their customers, to effectively complete their transactions and to hinder their potential to grow. That is why projects such as this are so beneficial to these areas." 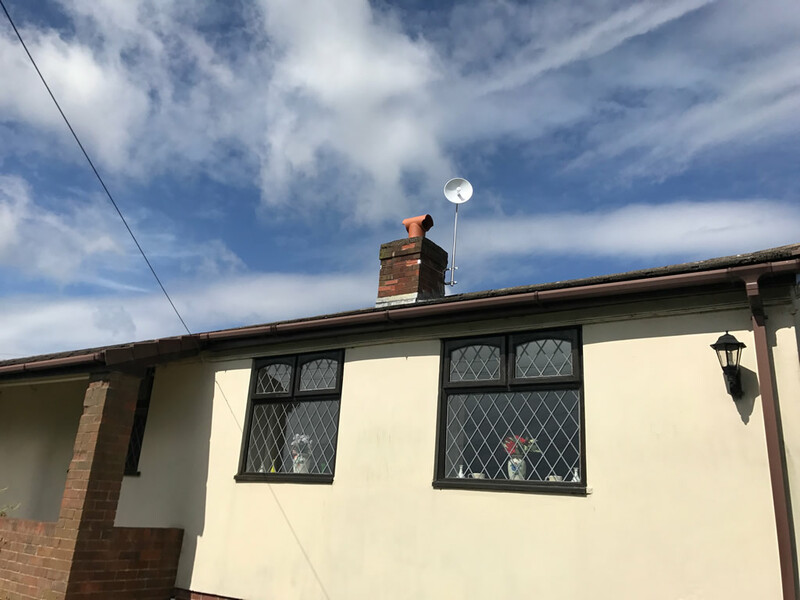 And so, from having some of the slowest broadband speeds in the country, the small community of St Edwards Park in Cheddleton is leading the way, with speeds that are faster than around 75% of the rest of Great Britain! 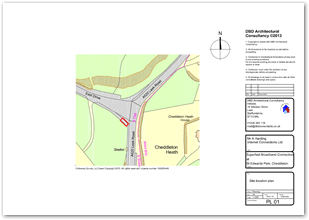 We've expanded our national network to include a new Point of Presence (PoP) in Cheddleton, Staffordshire. First of all, what's a Point of Presence or PoP? 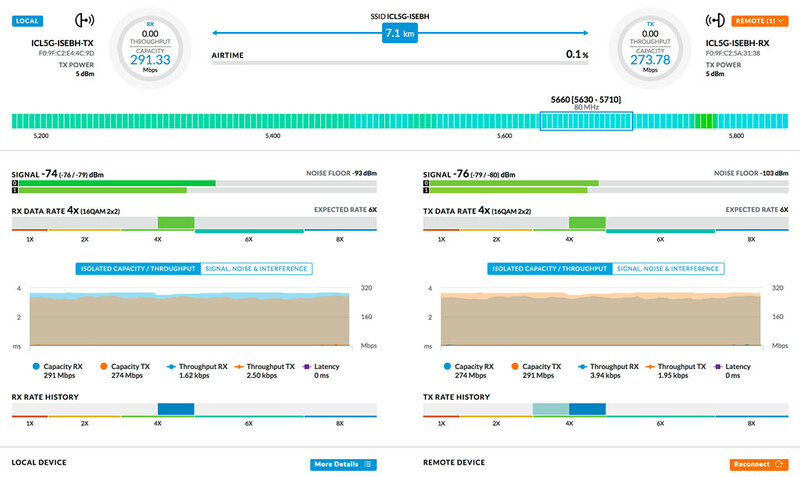 A simple definition would be an access point from one place, to the rest of the Internet. 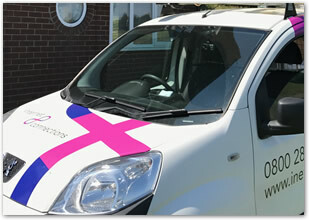 Our new local PoP allows us to break out and access our fibre network in Cheddleton. This latest investment serves two purposes: first of all, it was part of the infrastructure expansion that was necessary to deliver our community Superfast Broadband project to the nearby St Edwards Park estate. 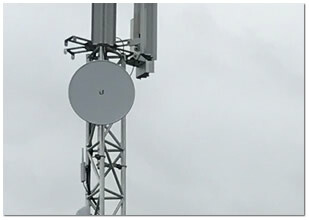 Secondly — and this is where the exciting part for local businesses comes in — the new PoP means we are now able to deliver our core service of high speed fibre connectivity to local sites at a significantly lower cost than was previously possible. Why's that? Until now, all of our PoPs have been located in and around the major UK Internet hubs of London and Manchester. 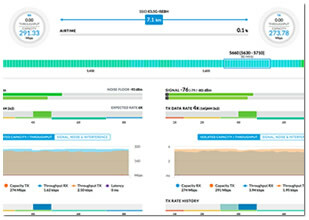 With fibre, the further the distance between your site and the PoP, the greater the cost of supplying connectivity. Whereas before, Staffordshire based businesses would have been required to source a connection from our nearest PoP in Manchester, suddenly the situation is changed. 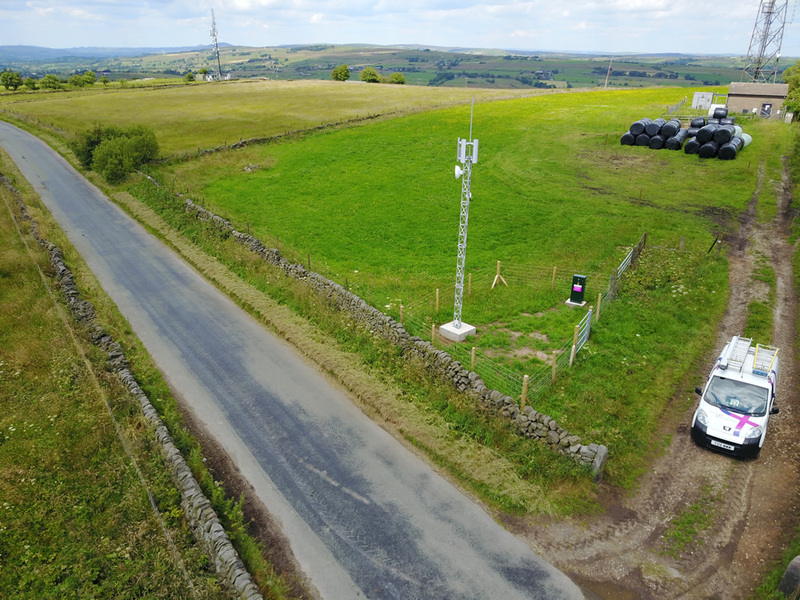 Now that we can source connectivity from our Cheddleton PoP, the distances involved for local businesses are cut dramatically — as happily, are the costs. Expanding our network here into Staffordshire is a going to have a really positive impact on our region. First of all, we can lower the price point at which existing local businesses can access the kind of high speed, dedicated connectivity services they need to increase their competitive advantage. That's a really important point to make — the reality is that for a lot of businesses these days, a lot of what they do is reliant on their Internet connection. The faster and more reliable that connection is, the more productive and successful they can be. At the same time, the fact that affordable commercial-level connectivity is now available in the region will be attractive to new businesses looking to move into the area, so we see this latest development as beneficial to the wider community too." Find out more about our high speed, dedicated Internet connectivity services here. We'd like to say a big thank you to Mark Glover of Ashley Construction (pictured to the right of our very own Andy Harding). As the Leek Post & Times reports, Mark (based in Trent Vale, Stoke) stepped in to carry out the recent civil works when our original contractor pulled out at the last minute. Mark's flexibility and intervention has been really important in keeping the project on schedule — we're counting down the days now! 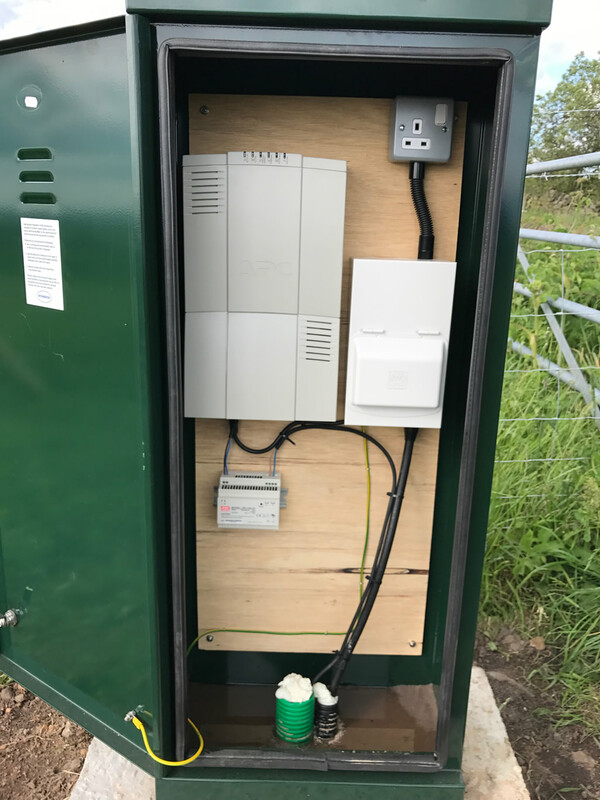 As many of you will have noticed, a shiny new green box has appeared at the entrance to St Edwards Park — superfast broadband is indeed coming soon! While the installation went very smoothly, we were disappointed to find that there had been an attempted break-in to the cabinet during the week (we think this took place on the night of 29th May). A quick word of appreciation to Rainford Solutions who designed our cabinet, which comes equipped with a range of very effective security features that helped to stop the would-be intruders from gaining access. Although there is nothing of resale value within the cabinet (the point is we use fibre, not copper — that's where the "superfast" bit comes from! ), we'd still appreciate your help in reporting any suspicious future activity. Our 24-7 operations number is 0800 612 7802. Note that our team kitted out in bright pink hi-vis jackets does not count as suspicious activity! 1. Power: the cabinet will be connected to a power supply on the 18th June. 2. Fibre: the cabinet will be connected to our fibre network before the end of June. We're still awaiting a definite date for that from Openreach. 3. Tie cable: this is scheduled for installation on the 8th July, but we're hoping to expedite this in order to meet our goal of getting the service up and running before the end of June. Calls to UK landlines will be 1p/minute during peak times (8am-6pm Monday to Friday) and 0.5p/minute during evenings and at weekends, while calls to UK mobiles will be 2.5p/minute at any time. The minimum call charge is just 2p. What's more, keeping in touch with overseas friends and relatives should (unfortunately for them if they moved to escape!) be a lot more affordable. For example, calls to the USA are just 0.96p/minute, and Australia 1.86p/minute. We hope the competitive rates are a welcome surprise for you — we're certainly very pleased! You can see the full rate tables on our website, where you'll also find a handy tool for working out the cost of any call you wish to look up. 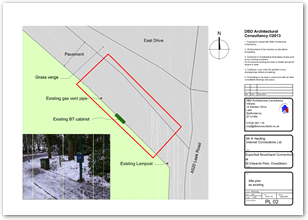 We had the great news today that our planning application for the new PCP box (the proposed green cabinet at the entrance to St Edwards Park to house our equipment) has been approved. So that's a nice big tick alongside a major milestone on our project plan — and what's more, it's a week ahead of schedule, which is fantastic as we're very excited to see some tangible progress on location. ...so it must be official! 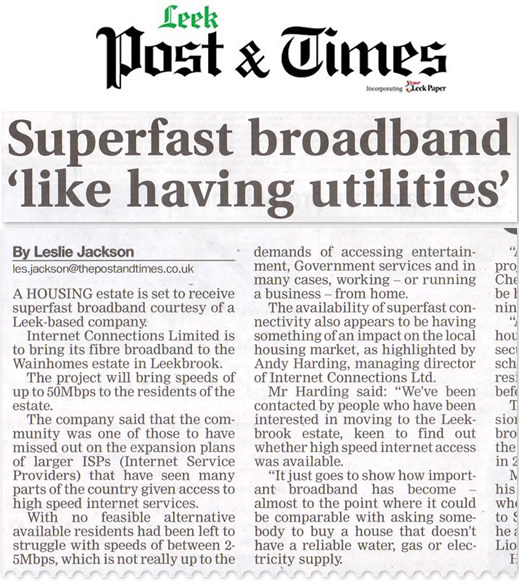 Andy and James talked with Leslie Jackson of the Leek Post & Times last week, about the reasoning behind our superfast broadband project, and how positive it feels to be working in the local area. As mentioned in the article, we're keen to work with local contractors who would be interested in quoting for the civil works that we need to carry out as part of the infrastructure build. If you're in that line of business yourself, or know of any contractors that you would recommend, please do get in touch. Our target of 50 pre-registrations has been toppled! And that means we're ready to go ahead and start the serious business of investing in the infrastructure that's going to bring superfast, ultra reliable, no-limits, 50Mb broadband to St Edwards Park. 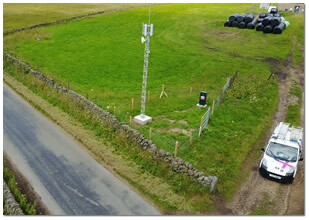 Thank you very much for your enthusiastic support in getting this exciting rural broadband project off the ground. Now we have your backing behind us, it's our job to turn all of this into a reality. If you've already pre-registered, look out for your invitation from us to place a firm order and reserve your place in the first batch of 24 households to be connected. If you haven't pre-registered yet, and would like to secure your place in the next batch, you can do so on our website. We wanted to let you know at this early stage that we may need to increase the monthly price by a small amount. Why is this? 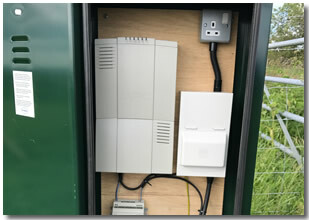 Well, during our planning phase, we received a verbal estimate of £3,000-£5,000 for carrying out the civil works (digging up the road and verges and then making it good again) that are required to connect our Superfast cabinet to a power supply. Now we're moving ahead with the construction phase, we have been given a significantly higher written quotation of £9,500. We're trying to find an alternative local contractor to carry out the work for us at a price closer to the original estimate, which will mean that the price increase won't be necessary. At this point then, the increase isn't certain, we just wanted to bring it to your attention as a change that we may need to make in the future. Our latest flyer seems to have kicked up something of a storm on St Edwards Park, as we've had some negative feedback from the Residents Association, who have raised some issues with us that we'd like to address here. The focus of their concern is our use of the St Edwards Park logo. 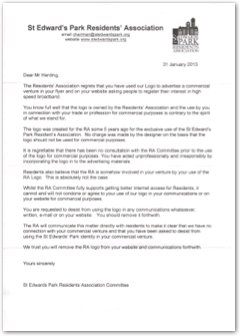 Although it was far from our intention, the RA have suggested that our use of the logo implies that our community broadband project is in some way linked with, or endorsed by them. We'd like to state — categorically — that this was not our intention, and there is no connection between the project and the RA. We really hope that we haven't caused too much offence among residents by using the logo, as our intention was purely to try and get the message across that this is a service that is genuinely being proposed for St Edwards Park. Following some valued and insightful feedback from several residents, we hoped it would be a good way of showing that this wasn't just the latest in a long line of campaigns from the major telecoms companies, who have a history of cruelly teasing our community with desirable services that they cannot provide! So, we find ourselves somewhat caught between a rock and a hard place. We would like to demonstrate that this is indeed a local project, but we do not want to fly in the face of the concerns of the RA. In order to try and bring this situation to an amicable close, we will be removing the logo from our website and it will not feature in any of our future communications. In the interests of full transparency, you can see the details of the complaint brought to us by the RA below, along with our official response (which unfortunately we have been unable to deliver personally as no correspondence address has been provided). We are of course open to your comments and feedback, which you can share with us via our website. There was a mistake on the planning notice so it will be removed until the council print a new one. The application will continue to progress. If you're particularly observant, you might have spotted the appearance of a yellow planning notice at the entrance St Edwards Park! 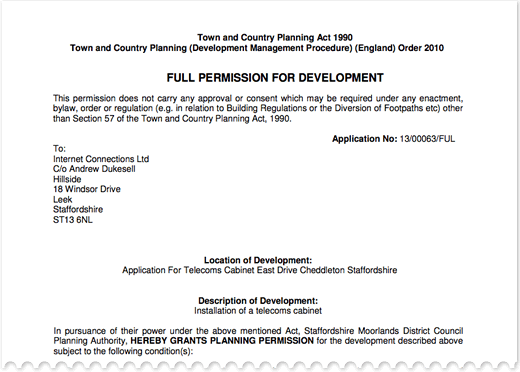 This means our planning application for the Superfast cabinet has moved on to the "validated" stage. Keep an eye on our news page for more updates on the progress of the application. It's a question that a lot of you have been asking, and we're now in a position to provide the answer! Superfast broadband will be available for a monthly fee of £19.99, plus £12.99 for your line rental. That's a total of £32.98/month including VAT, for no limits, bona fide superfast broadband. So, you will need to switch your phone service to us to get our superfast broadband, but don't worry, the good news is that we promise to beat BT for the cost of all our calls! Things are getting exciting... While we're getting ever closer to our pre-registration target of 50 households, we've been very busy behind the scenes, preparing the groundwork so that we can get things off to a flying start when we hit the magic number. 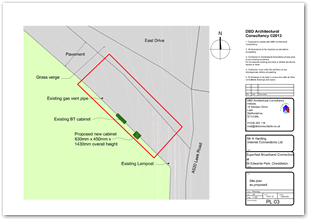 Last week we submitted a planning application for the Superfast cabinet, which would eventually be sited at the entrance to St Edwards Park, on East Drive (right next to the existing green BT PCP box). Take a look at our "How it works" page to see how the cabinet fits into the plan. If the application is successful, we will then move onto the next stage, which is to apply for a Section 50 streetworks license from the council, which we'll need to go ahead and build our cabinet. The plans will be made public soon, but you can see them for yourself here (click an image to get the full document). A big thank you to Andrew Dukesell over at DBD Consultants for his great work and help with providing the plans in (quite appropriately for this project!) super quick time. 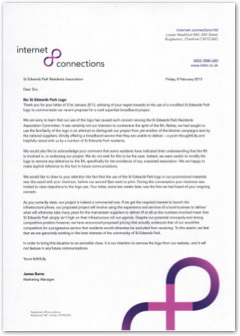 Residents of St Edwards Park, Cheddleton, Staffordshire have been invited to register for a proposed high speed broadband project to be delivered by locally based company, Internet Connections Limited. Promising speeds of up to 50Mbps — or 10 times the current average speed available to St Edwards Park residents — the service will bring forward access to so-called "superfast" Internet connectivity to this rural community. "Like many rural communities across the country, St Edwards Park is faced with a long wait for the roll out of superfast broadband. In fact, Cheddleton doesn't even figure in BT's fibre network plans for the foreseeable future. 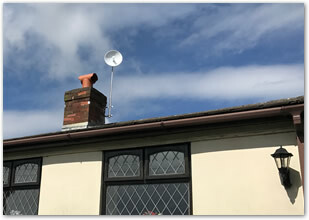 It made sense to take matters into our own hands and use the connectivity expertise and infrastructure available through Internet Connections to get high speed Internet out here to St Edwards Park in a much shorter time scale." 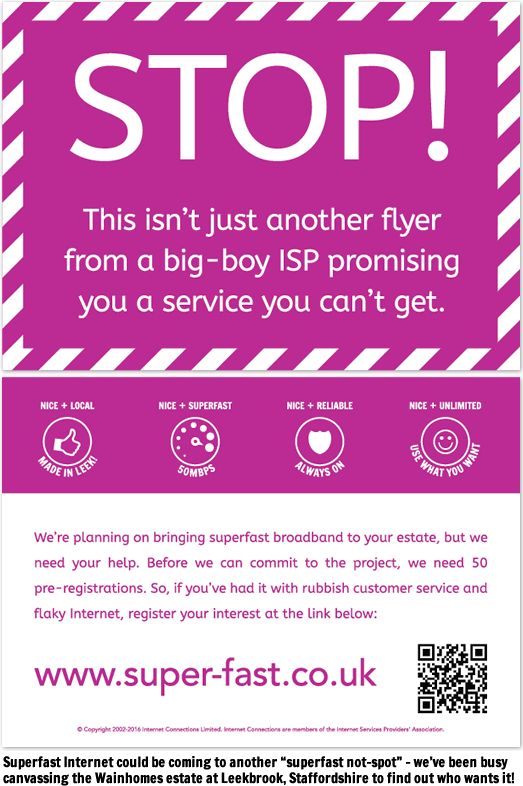 For further information, please see the Superfast broadband project website. Internet Connections Limited today announced it had become a member of The Internet Services Providers' Association (ISPA), the UK's Trade Association for providers of internet services. "Although membership is entirely voluntary, we know it's vitally important that our customers can feel absolutely confident in the service that we provide. Joining ISPA is a great stamp of approval for Internet Connections, signalling as it does, our allegiance to the ISPA UK Code, and commitment to good business practice." Full details of the ISPA Code of Practice can be found here. View The Small Print / Legal Mumbo Jumbo Fireworks image designed by Freepik — thanks!